Great Easter Basket fillers. Cadbury Caramello Bunnies. Yummy milk chocolate with a creamy caramel center in the shape of little bunnies. How perfect is that! It's hard to resist these little bunnies yummy milk chocolate and creamy caramel all in one treat. 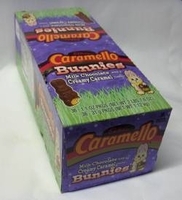 36 1.2oz caramel bunnies per box, each individually wrapped.